Georgia the Pot Bellied Pig - from an unlimited intake shelter in Chicago. What a DIVA she is!!! Condo piggy to rural house piggy! The Grey Bull, my gentle giant of a horse. 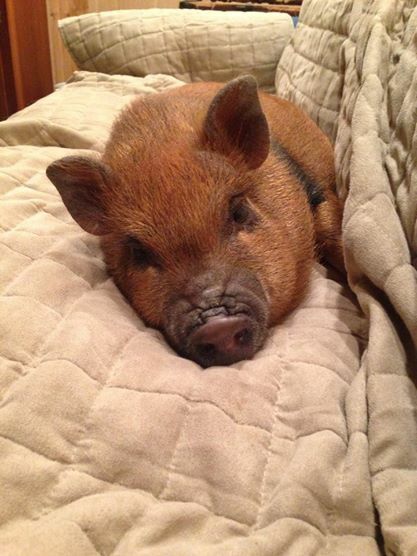 Priscilla the Pot Bellied Pig - another sweet gal rescued from an unlimited intake shelter in Chicago. Just got to big and noisy for city life but she is Georgia's BFF and loves all the visitors here! Rescued from Missouri - what a road trip we had! 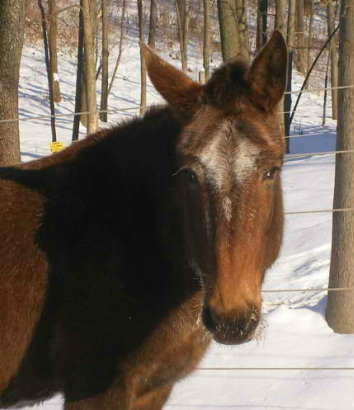 She is a delightful little mule! The Sweet Goats. Lucy, Scout & Ranger. Went to the Kewanee sale barn to show a friend market day. In the 'off to the butcher' pen was this sweet pregnant goat crying for a pet. Well you know what happens when I see her. I'm bidding on this goat. I win her and she rides home in my car - happy as can be. 1 week later I have the most adorable baby goats! They love kids and vistors! How could I forget the fowl. Here is Chaos the duck visiting the 'girls' My hens are in their coop (afternoon they go on walkabout) The girls are so good at providing eggs. There's Blackberry, Cinnamon, Itsy & Bitsy. Do you like the coop? It even has insulation and a heater.